The Brachial Plexus and Peripheral Nerve Program at Nicklaus Children’s Hospital provides comprehensive care for newborns, infants and children suffering from injuries or tumors of the peripheral nerves. Problems with the peripheral nerves may result in weakness, numbness and/or discomfort in the affected part of the body. The brachial plexus is a network of nerves within the neck that supply the arm with motor input and sensory feedback. Injuries to the brachial plexus can occur during the birthing process or as a result of trauma, including falls, sports injuries, penetrating injuries (stab wounds/gunshot wounds) and motor vehicle collisions. In addition to our focus on the brachial plexus, the Program also provides care for children with injuries or diseases (including tumors) of other peripheral nerves throughout the body. Who is a Candidate for the Program? Infants and newborns with limited or no movement of the shoulder, elbow, wrist or hand following birth. Children or teens who have experienced trauma and have weakness or reduced sensation in the hand/arm or any other part of the body. Children who have unexplained weakness, numbness, pain or discomfort in an arm or leg. At the initial visit, your child will be evaluated by members of the team that specialize in care of peripheral nerve problems. A medical history will be taken. Please bring all medical records and radiology images/reports associated with the peripheral nerve problem. Some children may require one or more imaging studies or other diagnostic tests to evaluate nerve and muscle function. Additional diagnostic studies, including nerve conduction and/or electromyography, may also be ordered. The treatment approach to peripheral nerve problems depends upon the nature of the problem. Many injuries, particularly “stretch injuries” will recover without requiring surgery. Some injuries, especially severe stretch injuries or lacerations, will require surgery to repair or reconstruct the affected nerves. 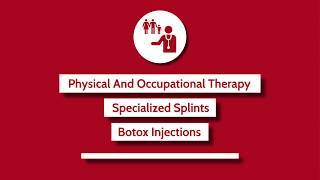 Specialized occupational therapy to maintain motion and prevent joint deformity in the affected arm. Specialized splints may be required to protect the joints from developing deformities. In some cases, botulinum toxin (Botox) is used to temporarily weaken “functioning” muscles that are contributing to joint deformity. After the Botox is given, intensive therapy is used to help strengthen the “weakened” muscles and place the shoulder in a better position. If the injury is severe, surgery may be required to release affected nerves from surrounding scar tissue, repair/reconstruct damaged nerves, or transfer “redundant” nerves to stimulate muscle function. Additional procedures that may be recommended as children grow, include release of tight muscles or joints, tendon transfers, or joint fusions. Pediatric patients with brachial plexus and peripheral nerve disorders benefit from a multidisciplinary approach that brings together a team of specialists to participate in evaluation and care management.